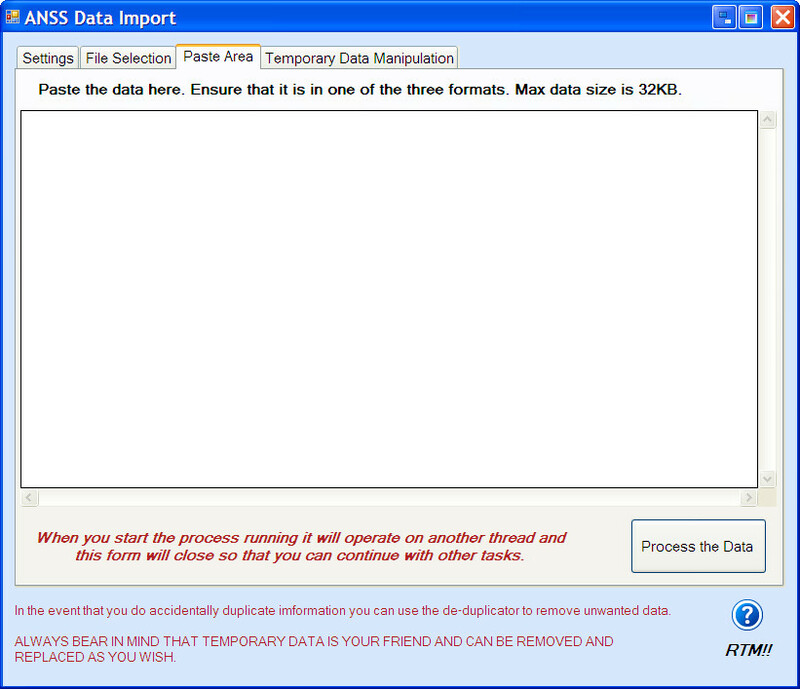 ANSS data, collected from the ANSS search page results, can be loaded into a table in the database either as a permanent data set or as temporary data that can be removed. It is generally expected that the data used for the Earthquake Data Assembler will from preference be ANSS data and thus before an analysis can take place there needs to be ANSS data available, or data from other sources. 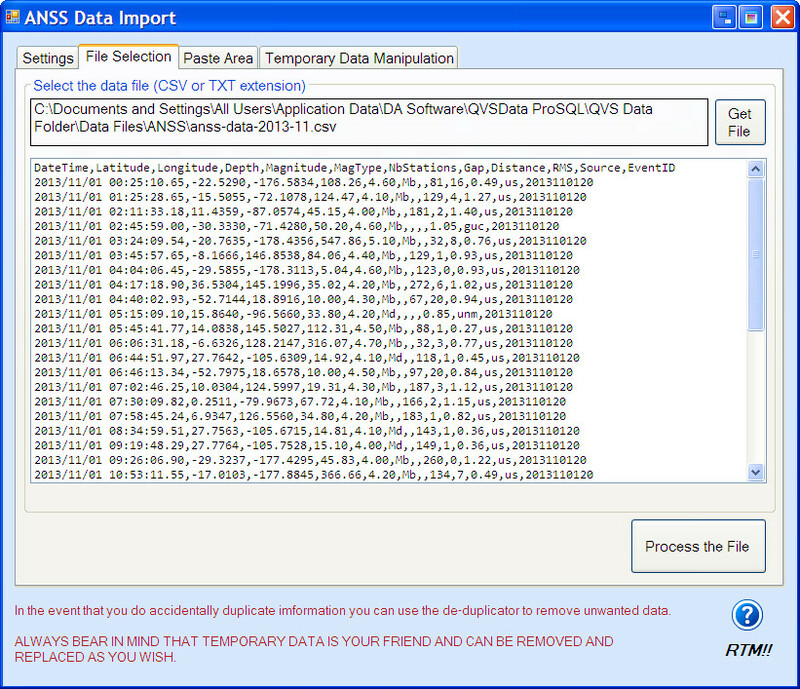 The only methods available for getting this data into the system are found in the ANSS Data Import routines. The form has four tabs – (1) Settings, (2) File Selection, (3) Paste Area and (4) Temporary Data Manipulation. Only the three formats offered by ANSS that are shown above are supported for import. Raw and KML are not supported at this time and currently are unlikely to be supported in the future. By setting a style with these three options you are telling the system what to expect when you import data from file or from a paste of the web data. The system will however check if it does not find what was expected and attempt to change to the format found. Normally data will be imported synchronously, in other words you have to wait for it to finish before you can do anything else. Using the checkbox below the three format options you can change this to a background import. If you have selected background loading DO NOT CLOSE THE QVS PROGRAM UNTIL YOU RECEIVE A MESSAGE SAYING THE PROCESS IS COMPLETED OR HAS FAILED. The statistics panel shows you the first ‘temporary’ data in the table and the last ‘temporary’ date in the table. Generally this should be the latest dated data in the table and it is assumed that all data between the two dates is contiguous and ‘temporary’. Also shown is the start and finish of the finalised data if any. 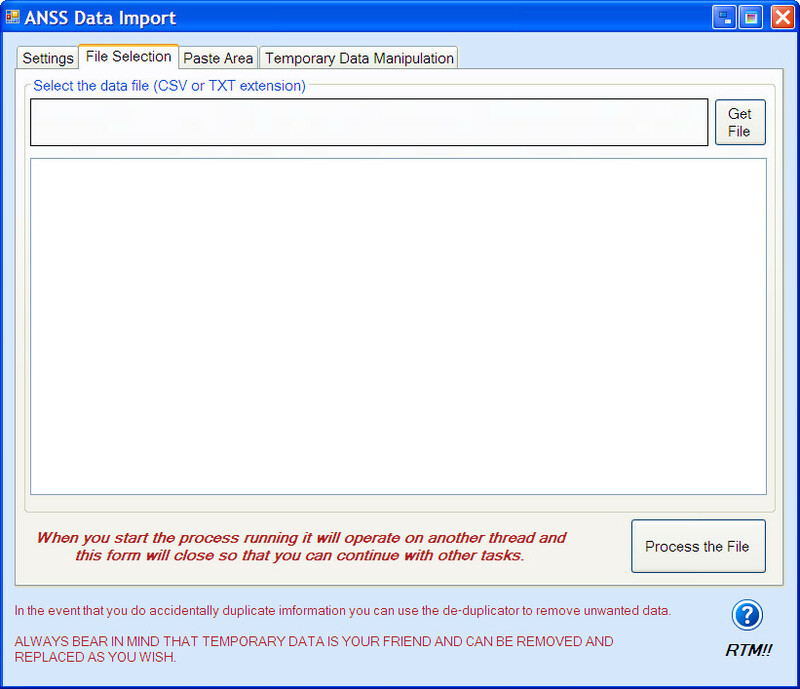 The screen above shows an example of finalised data where there is currently no temporary data. Also shown are the minimum and maximum magnitudes of the temporary data, and of all data including the temporary data. This may be a useful reminder of the cut off points you are using. If like me you wish to retain the ANSS data for multiple use then the system can accommodate that. There are huge volumes of data and you will find the system will struggle if you elect to import data for magnitudes less than Mag 4. In simple terms, take my advice and don’t do it! If you are using this approach then you should ensure that ALL data is collected (global – i.e no latitude/longitude constraints), that each tranche of data goes down to the same magnitude (i.e consistent magnitude cut off), and that you load data in smaller rather than huge chunks. The alternative approach is to use the table as a temporary data store for specific analysis runs that is subsequently discarded. As an example you may wish to study earthquakes in the Cascadia region so you would enter the latitude and longitude parameters and the time period and then import that data. You could add additional data if you wish to use several rectangles. The import will classify each item of data by it’s Flinn-Engdahl seismic region and area code and since that is the method of selection in the data analyser you will need to know the codes for the areas you are importing. The latitude and longitude boxes do not need to be contiguous and you could compare say Alaska to Japan by importing data from both areas. 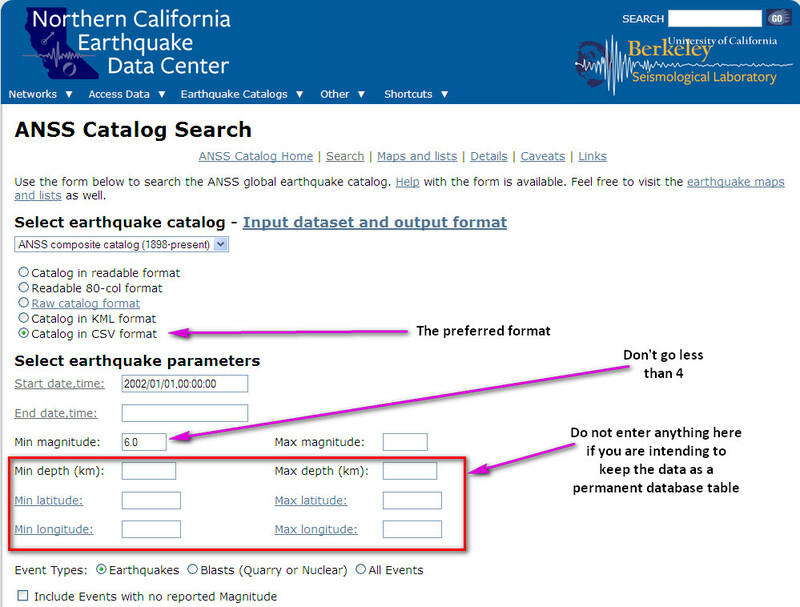 You can also use the circular (delta) method available in ANSS to specify a search area. To use file selection you have to have copied and saved the data to a CSV file or TXT file for the readable formats or have sent the results to the FTP site and retrieved the file from there. Whilst the extension (CSV or TXT) does not really matter it is best to reserve the CSV extension for files that really are comma separated variable files. Click on Get File and find your download. The name will appear in the text area beside the button. Based on the selection you made on the front tab the program will import the data when you click on Process The File and an hour glass cursor will appear on screen until the import is complete or the process will vanish into the insides of your computer and churn away to itself until it is done. Either way you will get a message saying how many records were imported when it finishes. This process is only suitable for small datasets and is designed to be used where data is not stored as a permanent set. There are no constraints on the range of data if you are using it for this purpose. All that is required is that the data is on one of the three formats shown on the front tab. Specifying the the data is of a particular format and then pasting data in a different format may crash the program although it does attempt to verify your selection so you may get away with it! The maximum amount of data that can be added using the paste method is 32KB. That is not a huge amount. For example if you tried to load all the Mag 6+ earthquakes from 2011 to 2014 it would stop at about February 2013. There is however no restriction on the number of times you can add data by this means so it is easy if somewhat slower to build a larger dataset. If you have selected background loading DO NOT CLOSE THE QVS PROGRAM UNTIL YOU RECIEVE A MESSAGE SAYING THE PROCESS IS COMPLETED OR HAS FAILED. 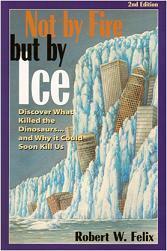 Most of what you need to know about this section is contained in the text on the tab so I will not repeat that. In this tab you elect to remove temporary data that is in the table, or convert it to final data. Once converted you cannot use these routines to delete the data and it becomes a permanent part of your data. The start and end dates are set to the first and last dates and should match the details of the statistics in the first tab. You can remove all of the temporary data, or a selection of months. It is best not to remove a slice of data from the middle of the temporary data unless you are replacing it but there is nothing to prevent you doing so. You will get a warning if the dates in the combo boxes are juxtaposed and for deletions a warning if you are removing a slice of data that does not start at the beginning or starts at the beginning but does not end at the end. If you selection for conversion does not start at the beginning of the TEMP data you will not be permitted to continue. Conversion does not have to end at the end of the TEMP data. There is a quick way to convert or delete all temporary data by setting the check boxes below the dates selectors. When this box is checked all temporary date will be removed regardless of the state of the dates selectors. Remember that ALL data entered into the ANSS table by whichever method is temporary data until it is converted. It is always best to plan what data you want if you are using this as a permanent database and to plan to load the data from the earliest to the latest. If for example you decide to load all ANSS data from Magnitude 4 upwards from 1965 to present the complete set is size = 5514 lines (435274 bytes). This is a manageable upload from file but as you get closer and closer to present the data size increases dramatically. 2013: Size = 10386 lines (1007438 bytes). Having said that this is also perfectly OK for a file import so you could collect 1 year at a time. All of the ANSS data for Mag 4 upwards from 1965 to 2014, and all Mag 5+ data from 1900 to 1965 is about 75Mb in the QVS Data format and well within the capacity of the database which can hold 4GB.